Yes. Many years ago, we picked up a trojan that allowed remote access to the computer or at least the appearance of remote access. One Saturday night, I was instant messaging with my friend in Oregon when words began showing up in the dialogue box. Filthy words. And whomever was typing them was instant messaging everyone on my Buddy List. So my friends were all answering in shock and anger! I was trying to type, “I’m not doing that” and the person or program was blocking me from doing so. Then a dialogue box popped up that said “Delete C:?” I freaked out and called America OnLine. They told me there was nothing we could do except shut down the computer and reformat which was extremely frustrating. Because I had recently begun banking on-line, ans was also using Quicken, I had to close all of my bank accounts because there was no way to ascertain precisely how much information the person who hacked into my system acquired. Shortly after that, I got a cable modem, several firewalls and as much spam, pop-up and virus blocking protection as I could muster. I keep it all up-to-date at all times! 1. Opening my eyes in the morning and realizing that I am still able to see. I used to have a cleaning service, but since I work from home I find it a bit intrusive. Anyway, with only two of us, nothing gets terribly dirty. LOVE your main course!! Isnt it great about your legs not rubbing together anymore? I can relate, I used to have that problem too. Scary salad!!! Wonderful feast! Wow, that really was a bad internet experience !! Sorry to hear about your salad. Sounds like a very frustrating experience. Love your main course. Part 2 is happily descriptive. Your bad experience was really scary! Just goes to show you that you can’t be too careful with internet security, huh. Your soup was a bad experience, I hope you never have to go through it again. And for your dessert, you are right, even I cannot imagine work without my cleaning lady. I love your dessert..wish I have one too:) And sorry about the bad experience you had..it’s scary for sure! 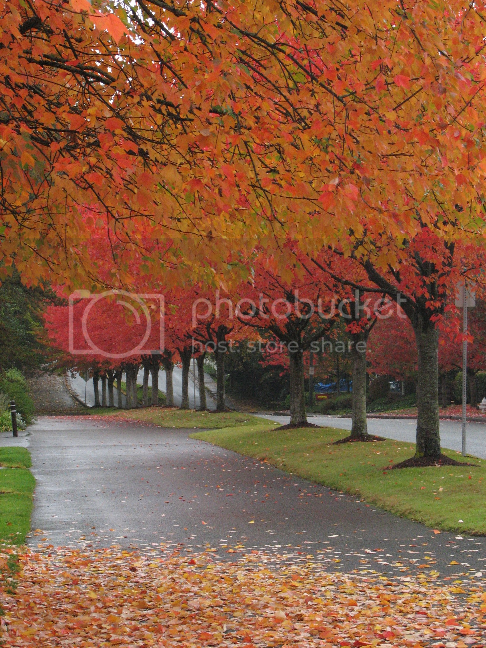 Beautiful photo of fall leaves!! You have a woofnderful main course. My Mom wants to loose weight too and is very impressed with what you said. Arf, Woof. A great main course. I am looking forward to walking wihtout getting breathless 🙂 A clenaing lady…..sigh……mind you, I think I would need one every day! Great feast! I love the picture of the autumn leaves. It won’t be long until we see the colors again. I love your main course. Wonderful reflections! 🙂 Have a great weekend. WOW!! that was a scary experience. Great fall picture. Congratulations on your weight loss. You should be proud of that accomplishment! Ha! I used to be your dessert but I retired! enjoyed your feast. Your salad scares me!!! Eek! I’m sorry you had to go through that. Your dessert sounds wonderful…can I borrow? Thank you for stopping by my feast. I love the photo you posted with your feast of the beautiful trees! !